Whilst I can’t claim to have had massive expectations from this book, the author’s reputation, experience, and the subject matter piqued my interest at first glance. This book is a collection of essays roughly sewn together reflecting the author’s personal experiences in the field of translation, either via conversations and experiences with translators and translations of his own works, or through translating by his own hand. As a collection of personal reflections collected together in essay form, there are plenty of interesting and oft amusing anecdotes which Eco ties together to support his thesis of translation as a form of negotiation between cultures. Relying to a large extent on examples taken from the various translations of his own works, he illustrates how the idea of translation must be seen through the capacity of the medium. That is to say that a language provides only a limited resource, and one rooted in its culture, which makes the art of translation a constant battle, a question of compromise, of content and connotation, of rhyme and register, of familiarity and foreignness. 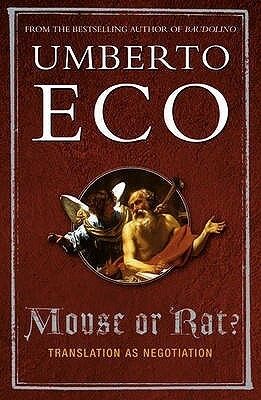 Eco’s own works provide plenty of toothy work for the translator, which he here amply dissects and compares, and these are at times supplemented by no lesser fry than the likes of James Joyce’s Finnegans Wake, for example. Eco’s thesis notwithstanding, there are problems with the book which for me detracted from its enjoyment. Firstly, as some other reviewers have pointed out, there are some pretty steep language requirements in order to really be able to fully understand many of Eco’s examples. Italian is, naturally, the most often quoted language, along with French and Spanish as a Romanic trio of languages, and German crops up on occasion. In the case of the latter, there were a number of obvious mistakes in the book, which no doubt rest to a large extent on it not being one of Eco’s stronger suits. Indeed, although nominally a work exploring translation as a whole, the author’s own (albeit impressive) lingual skills narrows it down to an investigation of translation between Romance languages and English, with really very little mention of non-Indo-European languages or cultures, where far more interesting problems doubtless arise. Another important detractor is that as the book is a compilation of essays based on a lecture series, rather than one contiguous treatise, there were numerous occasions where Eco repeated himself relatively excessively. One example which springs to mind is his quotation of W. V. Quine that a sentence such as “neutrinos lack mass” is for some languages of the world untranslatable, a quotation which crops up three or four times in different essays. One final criticism, although this is certainly more a matter of taste, is that with all that brain power, Eco tends to write with a lot of hubris. Another commenter quoted an excellent line which I think sums it up nicely: “Sometimes I ask myself if by chance I write novels purely in order to put in hermetic references that are comprehensible only to me. I feel like a painter who, in a landscape, puts among the leaves of the trees – almost invisible – the initials of his beloved. And it does not matter if not even she is able to identify them.” For all the fascination that the subject of translation has to offer, discussing the translation of symbols invisible to everyone but the author is certainly the most abstract and esoteric topic the author could have chosen to concentrate on. Ultimately this book offers a very interesting read, but only for the right, qualified reader. I should say a command of at least one Romance language is a must, as well as a reasonable familiarity with the field of translation. For the uninitiated, a more basic but also more thorough and elaborate investigation of the world of translation can be found in the recent Is That a Fish in Your Ear? : Translation and the Meaning of Everything.